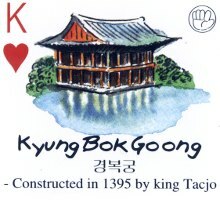 In these ‘Souvenir of Korea’ playing cards each card has a colour drawing of a Korean building, museum or cultural attraction with the title in handwritten letters and Korean printed script, and a brief description and details of how to get there printed beneath in dodgy English. There is also some kind of star rating system shown on each card. The two Jokers repeat two of the images from the cards. The Internet address printed on the box [www.folkartkorea.com] appears to be defunct. 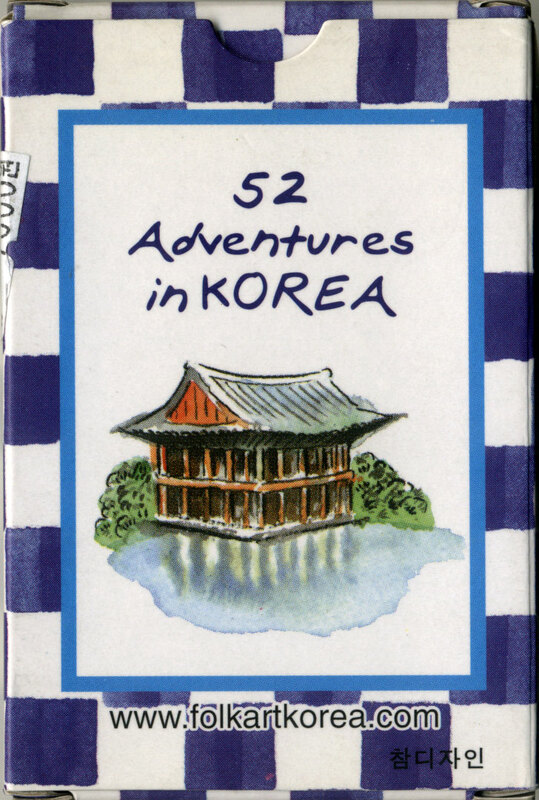 Above: “52 Adventures in Korea” Souvenir Playing Cards made in Korea. The cards are all-plastic and very slippery, which makes them awkward to pick up off a flat surface. 52 cards + 2 Jokers in window box. The back shows a blue design with a dragon in the central roundel. Cards courtesy Adam Wintle & Jinny Puprasert.